CONTEXT: In view of low incidence of contralateral nodal metastasis and increase in the morbidity, the opposite neck is not routinely addressed. However, contralateral nodal metastasis is seen frequently in a certain group of patients. Identifying those factors associated with higher chances of contralateral nodal metastasis may help in optimizing the treatment. AIMS: The aim of this study was to identify prognostic factors associated with contralateral nodal metastasis in cases of buccal mucosa cancers. SETTINGS AND DESIGN: A retrospective audit of 125 patients with squamous cell carcinoma of buccal mucosa at a tertiary cancer center. SUBJECTS AND METHODS: Those cases in which lesions were reaching or crossing midline were included in this study. All cases underwent surgery as primary modality of treatment and had bilateral neck dissection. STATISTICAL ANALYSIS USED: Chi-square test is used for evaluating the variables predicting contralateral nodal metastasis. Finally, a multivariate analysis was performed using binomial logistic regression to identify those variables that were independently associated with the risk of contralateral nodal metastasis. RESULTS: Among 125 patients, 53 cases were node negative. Ipsilateral nodal metastasis was seen in 44/125 (35.2%) patients, 26/125 (20.8%) had bilateral neck node metastasis, and 2/125 (1.6%) had isolated contralateral nodal metastasis. Among these 28 patients with contralateral nodal metastasis, 26 patients had ipsilateral nodal metastasis. Ipsilateral nodal metastasis and skin involvement were independently predictive of contralateral nodal metastasis. CONCLUSIONS: Contralateral nodal metastasis in the absence of ipsilateral nodal metastasis is very rare and frozen section of ipsilateral neck dissection specimen can be an important pointer for addressing contralateral neck. Nodal metastasis in patients with oral squamous cell carcinoma (SCC) is related to poor prognosis. An elective ipsilateral neck dissection is usually recommended in all cases. Contralateral nodal metastasis is occasionally seen, and prognosis of those cases is poorer., In view of low incidence of contralateral nodal metastasis and the apparent increase in the morbidity and patient discomfort, the contralateral neck is not routinely addressed. However, contralateral nodal metastasis is seen frequently in a certain group of patients. Fan et al. concluded that contralateral neck dissection is required when tumors cross midline, primary tumor more than 3.75 mm thick, advanced tumor, tumor arising from floor of mouth or base tongue, and presence of multiple ipsilateral nodal metastasis. However, literature on contralateral nodal metastasis for a particular subsite of oral cavity such as buccal mucosa is limited. The purpose of this study is to identify those factors associated with bilateral or contralateral nodal metastasis. This may help in optimizing the management of contralateral neck in buccal mucosa cancers. There were 108 men (86.4%) and 17 women (13.6%) with a male to female ratio of 6.3:1. The mean age was 51 years (range - 26–78 years) [Table 1]. Based on the AJCC staging system 7, 5 (4%) patients had T1 lesion, 11 (8.8%) patients had T2 lesion, 4 (3.2%) patients had T3 lesion, and 105 (84%) patients had T4 lesion. Among these 125 patients who underwent bilateral neck dissection, 72 (57.6%) patients had either unilateral or bilateral nodal metastasis and 53 (42.5%) patients were node negative on the final histopathology report. Ipsilateral nodal metastasis was seen in 44/125 (35.2%) patients, 26/125 (20.8%) had bilateral nodal metastasis, and only 2/125 (1.6%) had isolated contralateral nodal metastasis. Thus, in all 28/125 (22.4%) patients had contralateral nodal metastasis on final histopathology report. Eighty-two patients were clinically node negative bilaterally (cN0) and 119 patients (95.2%) were clinically node negative on the contralateral side at the time of surgery. Of the 82 patients with clinically N0 neck, 25 (30.4%) had ipsilateral nodal metastasis and 8 (9.7%) had bilateral nodal metastasis on final histopathology report. The thickness of the primary lesions ranged from 1 to 60 mm. As peer histopathology report, 7 cases (5.6%) were well differentiated, 79 (63.2%) were moderately differentiated, and 39 (31.2%) were poorly differentiated. Thirty-nine cases (31.2%) had perineural invasion and none had lymphovascular embolization. 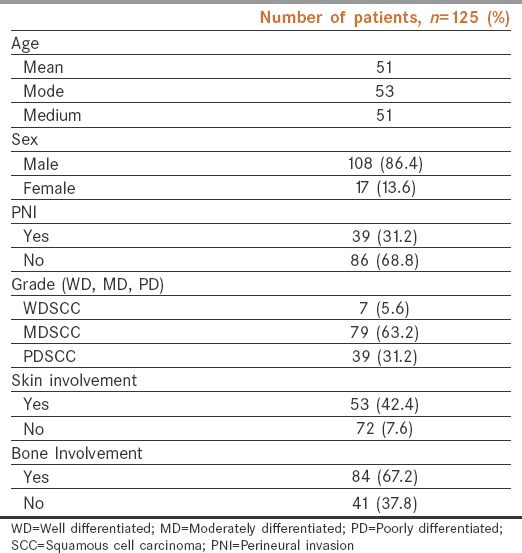 Skin involvement was seen in 53 patients (42.4%) and 84 patients (67.2%) had bone involvement. While most of these patients, 110 (88%) were treatment naive at presentation, nine patients (7.2%) received neoadjuvant chemotherapy, 1 (0.8%) had concurrent chemoradiotherapy before surgery, and 5 (4%) patients had incomplete surgery of the primary lesion. Multiple positive nodes were seen in 50/125 (40%) patients. Maximum number of positive nodes on the ipsilateral side was nine and contralateral side was eight. Among the 28 patients with positive contralateral nodes, 26 patients had ipsilateral nodal metastasis on final histopathology report. A univariate analysis was performed initially for those factors which are described to have a higher risk of contralateral nodal metastasis [Table 2]. The presence of ipsilateral nodal metastasis (P < 0.000), grade of tumor (P = 0.045), and skin involvement (P = 0.007) were significantly associated with contralateral nodal metastasis. On multivariate analysis, presence of ipsilateral nodal metastasis (P < 0.000) and skin involvement (P = 0.001) were the two factors which were independently associated with contralateral nodal metastasis [Table 2]. This study is on a group of patients who are expected to have a higher percentage of contralateral nodal metastasis because of the extent of lesions beyond midline and the majority having pathologically advanced disease. We found the incidence of contralateral nodal metastasis was 22.4%. Among the seventy patients with ipsilateral nodal metastasis, 26 (37.1%) had contralateral nodal metastasis which is similar to that reported in literature. Woolgar  also reported a higher incidence of contralateral nodal metastasis (18.18%) among the 143 cases showing ipsilateral node positivity. Singh et al. showed contralateral node positivity in 69 patients (41.5%) among 166 tongue cancer cases having ipsilateral nodal metastasis. Interestingly, in patients with clinically N0 status, although the percentage of ipsilateral nodal metastasis is 30.4%, the percentage of contralateral nodal metastasis is only 9.7%. Obviously, routine contralateral neck dissection in this category of patients may be unnecessary. Therefore, identifying factors that may predict contralateral nodal metastasis can be helpful in such a situation. Kurita et al. in a retrospective study of 202 patients with SCC of the oral cavity did not found tumor extension across the midline as an independent and significant predictor for contralateral nodal metastasis. We found ipsilateral nodal metastasis and skin involvement [Table 2] as an independent predictor of contralateral nodal metastasis. Kurita et al. on multivariate analysis also demonstrated that ipsilateral lymph node metastasis (P < 0.01) along with T-stage (P < 0.01) and histopathology grading (P < 0.05) were significant independent predictors for contralateral lymph node metastasis. Singh et al. on multivariate analysis showed pathological T-stage and the presence of ipsilateral nodal metastasis as predictors of contralateral nodal metastasis in tongue cancers which are reaching or crossing midline. In the absence of ipsilateral nodal metastasis, contralateral nodal metastasis is extremely rare, we found only two patients with isolated contralateral nodal metastasis (1.6%). As mentioned earlier, we notice that the chance of contralateral nodal metastasis in patients with clinically N0 status is rare and the presence of ipsilateral nodal metastasis is a major factor that increases the risk of contralateral nodal metastasis in this group. Rao et al. showed that frozen sections of neck dissection specimens are accurate in predicting nodal status. Hence, frozen section of ipsilateral neck dissection specimen can be an important indicator to decide when to address contralateral neck. Skin involvement was the second independent factor predicting the risk of contralateral nodal metastasis. In our study, 53 patients had skin involvement (42.4%); among them, 18/53 patients (33.96%) had contralateral nodal metastasis and 28/53 patients (52.83%) had ipsilateral nodal metastasis. Oral cavity SCC has a high incidence of cervical micrometastasis and bilateral metastasis is seen frequently because of the rich lymphatics in the submucosal plexus, which freely communicate across the midline. Direct skin involvement is also a prognostic sign of poor outcome as skin involvement will upstage the disease to T4 as per the AJCC staging system. In cases of lateralized buccal mucosa cancers where lesions reach or cross midline, the presence of ipsilateral nodal metastasis as well as skin involvement is important factor influencing contralateral nodal metastasis. Skin involvement has emerged as an important prognostic factor for nodal metastasis in this study. Further research is needed to conclude whether contralateral neck dissection is required for lateralized buccal mucosa lesion not crossing midline but involving skin and having ipsilateral nodal metastasis. Contralateral nodal metastasis in the absence of ipsilateral nodal metastasis is very rare and frozen section of ipsilateral neck dissection specimen can be an important pointer for addressing contralateral neck. Kurita H, Kobayashi H, Ohtsuka A, Koike T, Kurashina K, Tamura M, et al. Contralateral cervical lymph node metastasis from oral squamous cell carcinoma. Jpn J Oral Maxillofac Surg 2003;49:186-91. Kowalski LP, Bagietto R, Lara JR, Santos RL, Silva JF Jr., Magrin J. Prognostic significance of the distribution of neck node metastasis from oral carcinoma. Head Neck 2000;22:207-14. Fan S, Tang QL, Lin YJ, Chen WL, Li JS, Huang ZQ, et al. A review of clinical and histological parameters associated with contralateral neck metastases in oral squamous cell carcinoma. Int J Oral Sci 2011;3:180-91. Woolgar JA. Histological distribution of cervical lymph node metastases from intraoral/oropharyngeal squamous cell carcinomas. Br J Oral Maxillofac Surg 1999;37:175-80. Singh B, Nair S, Nair D, Patil A, Chaturvedi P, D'Cruz AK. Ipsilateral neck nodal status as predictor of contralateral nodal metastasis in carcinoma of tongue crossing the midline. Head Neck 2013;35:649-52. Rao RS, Deshmane VH, Parikh HK, Parikh DM, Sukthankar PS. Extent of lymph node dissection in T3/T4 cancer of the alveolo-buccal complex. Head Neck 1995;17:199-203.